1. The Bill for the Town of Guyldford. L. 3. 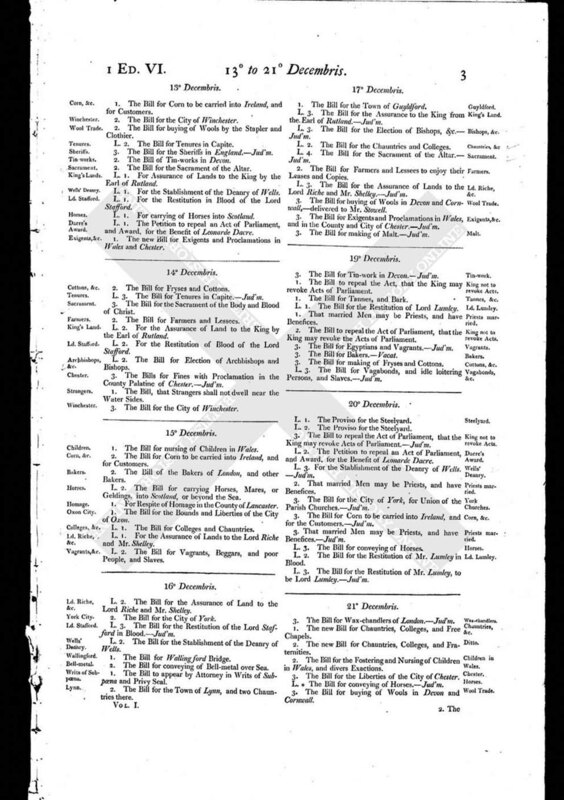 The Bill for the Assurance to the King from the Earl of Rutland. - Jud'm. L. 3. The Bill for the Election of Bishops, &c. - Jud'm. L. 2. The Bill for the Chauntries and Colleges. L. 4. The Bill for the Sacrament of the Altar. - Jud'm. 2. The Bill for Farmers and Lessees to enjoy their Leases and Copies. L. 3. The Bill for the Assurance of Lands to the Lord Riche and Mr. Shelley. - Jud'm. 3. The Bill for buying of Wools in Devon and Cornwall, - delivered to Mr. Stowell. 3. The Bill for Exigents and Proclamations in Wales, and in the County and City of Chester. - Jud'm. 3. The Bill for making of Malt. - Jud'm.